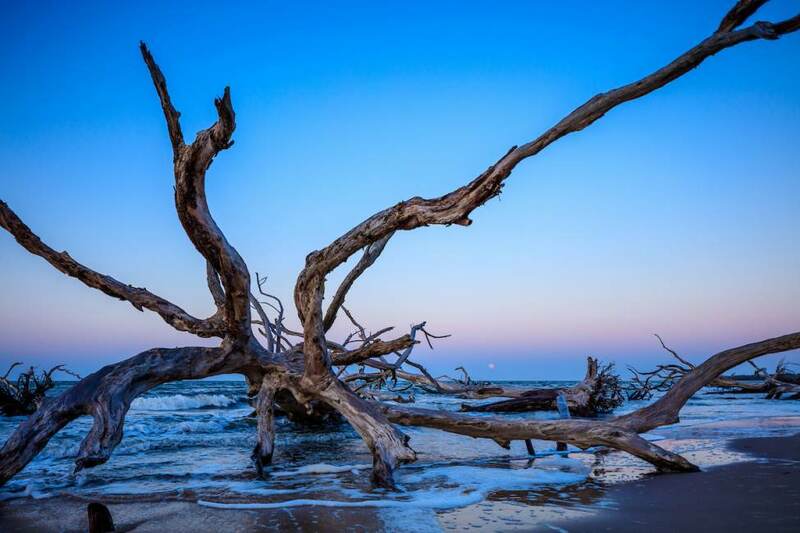 ​Spend the Weekend in Jacksonville’s Most Unforgettable Camping Spot: Little Talbot Island. Little Talbot Island State Park is one of the best places to experience unique Florida camping. You can tent camp along Myrtle Creek, or sway among the trees in one of their designated hammock campsites. Best of all, you can bring your furry friend with you! EARLY MORNING: Checking in early into your campsite is the best way to get the most out of your stay. Little Talbot offers 36 campsites, each one has 20 and 30 amp electricity, fresh water, fire ring and picnic table. Some are waterfront, others immersed in the vegetation of the area, so get there with plenty of time to pick your favorite spot! The hours between breakfast and lunch are prime time to set up and explore the area. There’s a small trail (only three-quarters of a mile) near campsite 39 that will take you around the campground to meet your neighbors. Part of the trail will take you along Myrtle Creek, where you may see gopher tortoises or marsh rabbits. Check out the fire pit close to campsite 16 (and be sure you don’t forget your s’mores stuff). Then, make an easy lunch. PB and J’s are a classic. AFTER LUNCH: It’s time to hike the four-mile Dune Ridge Trail. This trail will take you across tall dunes covered in pine needles and leaves. The valleys drop off next to the trail, covered in immensely tall pines and moss-covered live oaks. Then, the trail will open up into two miles of pristine beach (unfortunately, furry friends aren’t allowed here). Here, there is an opportunity to see shorebirds that call Little Talbot their home, Wilson’s Plovers skitter along the beach. Black Skimmers fly overhead. Royal Terns dot the dunes. The cool ocean water laps at your feet. Preservation at its finest. Stay here for a while and enjoy the breeze. When you reach the end of the beach, you’ll walk over a short boardwalk to continue following the trail. It’s back into the dune riddled forest to return to the trailhead. NIGHT TIME: After dinner, it’s time for a visit to the fire pit to roast some s’mores and tell ghost stories. Play card games or dominoes if you’re a scaredy-cat. Enjoy the sound of crickets chirping in the background. EARLY MORNING: Wake up bright and early for a good old-fashioned camp breakfast. After cleaning up, it’s time to see the infamous Blackrock Beach and Boneyard Beach, this is where the skeletons of giant live oaks have been bleached and dried by the sun. It’s at Big Talbot Island State Park, which is less than a five-minute drive, or a quick bike ride from Little Talbot. It’s a popular picture spot and a beautiful way to start the day. AFTERNOON: Since check out is at 1 p.m., it’s important to get in one of the most unique water opportunities while you can. Take a tour with Kayak Amelia before you head out. Their marsh tour takes you through Simpson Creek, which connects Little Talbot with Big Talbot. You’ll also kayak through Fort George Estuary. This tour gives ample opportunities to see the Talbot Islands wildlife, including ospreys. With so much to do, you’ll get plenty of chances to enjoy natural Florida! -The campground offers a laundry facility and two bathhouses with hot showers. Both restroom facilities are ADA accessible. -A dump station is available at the campground exit for RV campers. -Maximum RV length = 30 ft.
-Bicycles can be rented for $2 per hour, $10 per day or $15 per weekend at the ranger station. -Firewood can be purchased for $7 a bundle. -Bagged ice can be purchased for $3 a bag. -Leashed pets are welcome in campground, on the trails and paved areas. They are not allowed on the boardwalks or beaches. -Canoe and Kayak Launch available at Long Island Outfitters, cost is $1.